Employing Same Dose Of Resveratrol, Heart Researchers Vindicate Discredited Researcher Dipak Das, PhD (Deceased). East Indian-born, University of Connecticut researcher Dipak Das PhD (deceased) has become a poster boy for scientific fraud.Or was the witch-hunt launched against him a fraud in itself? In 2012 popular radio show host Rush Limbaugh announced that Dr. Das “made it all up,” that is, all the science he published to show that the red wine molecule resveratrol protects the heart from damage before a heart attack occurs, considered the best form of cardio-protection said Dipak Das at the time. The University of Connecticut posted a website, no longer available for examination, that allegedly showed Dr. Das doctored what are called “western blot tests” used to depict the amount of gene protein actually activated by any therapeutic or preventive agent. The University produced 60,000 pages of evidence accumulated over a period of 4 years, but if the evidence were so convincing, why is it not available for review today? Researchers in Italy and Canada have also shown that resveratrol protects the heart from damage should a heart attack occur. 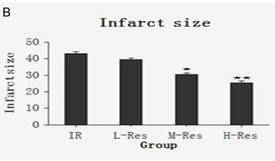 Infarct size = area of tissue damage Dept. Cardiology, China Three Gorges Univ.